On March 3, 2015 the Philadelphia Eagles & Buffalo Bills shocked the NFL world as they announced that they were making a big and rare, player-for-player trade. 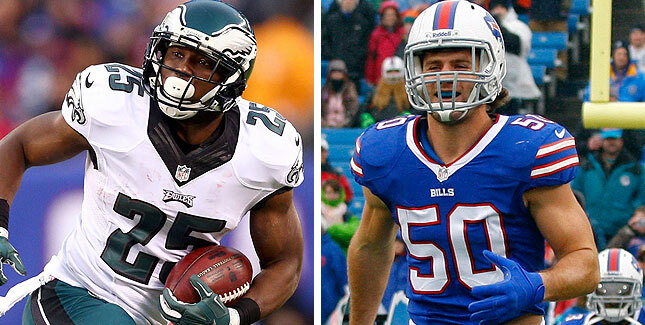 The Eagles sent their all-pro star RB LeSean McCoy to the Bills for their young defensive star, LB Kiko Alonso. Both teams are doing all they can to get their teams back to the playoffs, and this trade is a statement as to how serious they are. With the release of veteran LB Trent Cole and what appears to be the impending departure of DE/OLB Brandon Graham, the Eagles have secured the services of a linebacker who has only played one full season in the NFL, but was second in voting for NFL Defensive Rookie of the year in 2013. The Bills came to an impasse with soon to be free agent RB C.J. Spilller as both sides could not reach an agreement on a new contract. Now the Bills have acquired one of the top RB’s in the league, in LeSean McCoy. There are many positives to this trade. The Eagles gain more youth on defense with Alonso, who has proven that he can play both outside and middle linebacker, and say good-bye to McCoy’s large contract. The Bills now have a workhorse RB, something they have lacked lately, who is only 27 and has many years left to play. Fans of both teams were stunned and heart broken when this trade happened. McCoy has been the most productive player on offense, and arguably has been the Eagles best offensive player since he arrived. Alonso had a fantastic rookie season and had Bills fans drooling over the possibility of what he could accomplish under new head coach Rex Ryan’s defense. Now that some time has passed, fans have had a chance to take in this trade and how it will help their teams. As I write this article, we are less than 12 hours away from the start of the new league year in the NFL and thus the start of the Free Agency signing period. Since the trade neither team has rested. The gaping hole at RB for the Eagles appears to be filled with the impending signing of soon-to-be former 49’ers RB Frank Gore. The Bills over this past weekend have restructured LeSean McCoy’s contract, giving McCoy more guaranteed money and giving the Bills less of a cap hit per year. Also, to insure that their defense doesn’t get hit harder, the Bills today re-signed DE Jerry Hughes, who was set to become a free agent. All of this, and we still have free agency to look forward to, as both the Eagles and Bills are expected to become strong players during this time of the offseason. Both teams are well under the salary cap, and have their eyes set on who else can come in and help them next season. Eagles head coach Chip Kelly has more power and is doing all that he can to mold the Eagles into the team that he wants it to be, as he continues to surround himself with more former Oregon Ducks. Bills new owner Terry Pegula, GM Doug Whaley & head coach Rex Ryan have begun the task of making the Bills a serious contender, something the Bills have not been for quite some time. If either of these teams are able to reach the promised land, we may want to look back on this trade as the point in time when it all began. Sit back and get ready folks, it should be an amazing ride. This entry was posted in American Football, NFL, Philadelphia Eagles and tagged bills, eagles, kiko alonso trade, lesean mccoy trade. Bookmark the permalink.